In an area known primarily by backpackers, there lies a short, level, day hike. 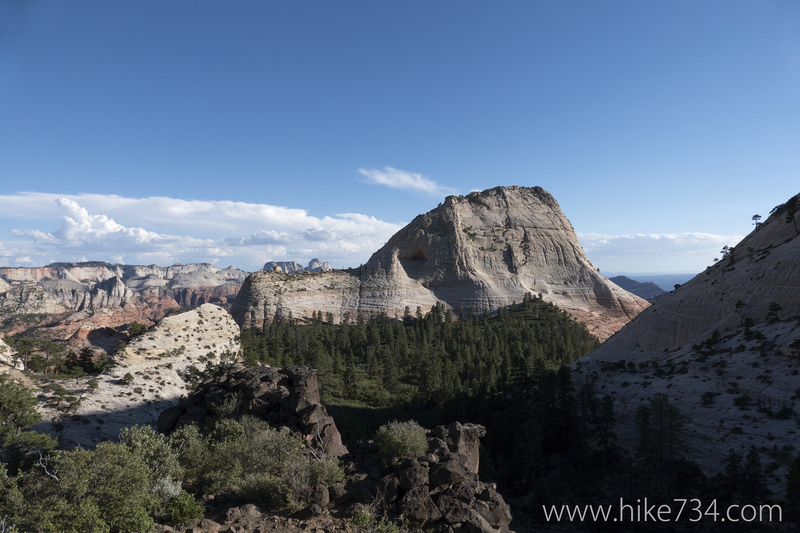 This hike, through the pine forests of the high desert, takes you to an overlook strewn with volcanic rock and features grand views. A drive up the Kolob Terrace Road brings you to the Wildcat Canyon Trailhead. Follow the trail through the sagebrush meadows and into the open ponderosa forest. Keep an eye out for birds, rabbits, lizards and, if you’re lucky, a rare glimpse of elk in the evenings or early morning. The trail intersects the Connector Trail which you’ll take heading east until the Northgate Peaks Trail breaks off to the right. Views to the left look down into the Russell Gulch area and towards the West Rim. The trail for the Top Down Route of the Subway drops into that canyon via a well-marked trail, however, you’ll stay right and wander through the forest, eventually coming to the Northgate Peaks. The views from the overlook are to the south to the North Guardian Angel between the Northgate Peaks. 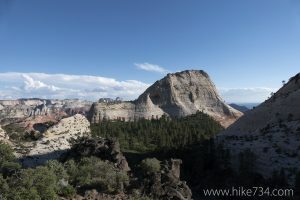 From this perch on large volcanic boulders, views down into red rocks of other canyons in the distance provide a little bonus. This is a great, level out-and-back trail. Head back to the trailhead the same way you came. Trailhead: In the town of Virgin, UT, take the Kolob Terrace Road north to the signed Wildcat Canyon Trailhead. The trail takes off from the parking lot.